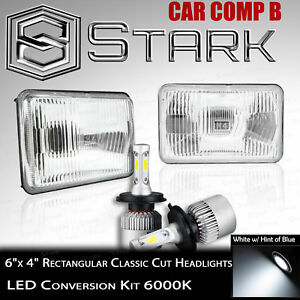 starklights has no other items for sale. VERY GOOD PEOPLE TO DEAL WITH. EXCELLENT! Awesome seller and it got here super quick !!! Fast shipping. Looks great. Super bright. Fits 84 c10 housing very loose. Five Star Seller. A Pleasure Doing Buisness With! The glass was supposed to fit my 1992 P30 chassis motorhome, it doesn't. My original headlights are 6 1/4 X 41/2 and these are as adveritsed 6 X 4. The glass rattles in the frame when installed. Try using 1/4 inch plastic tube around the frame or some other filler. I have installed these on my 87 Grand National, and also on my 86 El Camino. They both take these 4 X 6" head lights.The lenses are stock appearing, which is what I was looking for You have to modify the stainless frames, slightly.Not a big deal. I get a kick out of others who pay hundreds of dollars for LED head lights understanding that these are available. These are very bright and easily aimed to avoid blinding other drivers. Great item very bright exact fit look original.